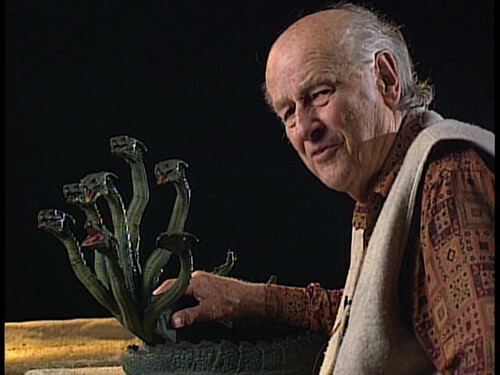 Ray Harryhausen died on Tuesday, May 7 at the age of 92. 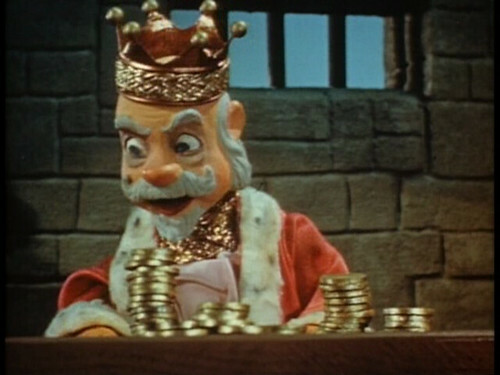 He had a good run, starting out by animating stop-motion models of dinosaurs, inspired by KING KONG (1933), for short color 16mm movies made in his parents’ garage while he was a teenager in the 1930s and ending with the Greek mythological epic CLASH OF THE TITANS in 1981. In between, he did the “technical effects” as billed on his first feature, or “special visual effects” as they were usually billed, for some of my all-time favorite movies. 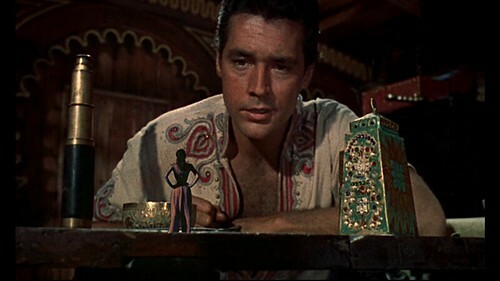 I was lucky to have seen many of his movies on the big screen when they were first released, starting with THE SEVENTH VOYAGE OF SINBAD (1958), which my father took us to see on Lincoln’s Birthday in 1959, when I was five. 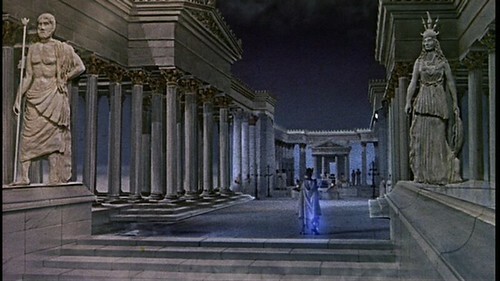 Even though I’d seen Disney features in theaters before then, as well as a memorable double bill of THE ROBE and DEMETRIUS AND THE GLADIATORS, I believe it was SINBAD that first triggered a love of the motion picture art form, particularly the more fantastic genres. 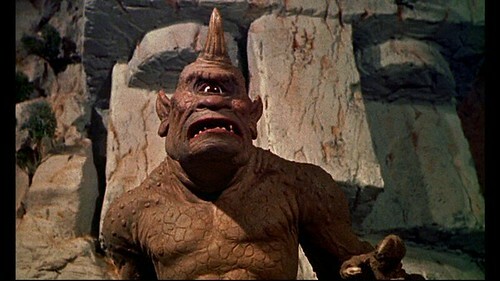 The Cyclops was a truly formidable monster and done in such a vivid and exciting manner that there was something consistently compelling about him and the way he reacts to having his domain invaded by these pesky humans. 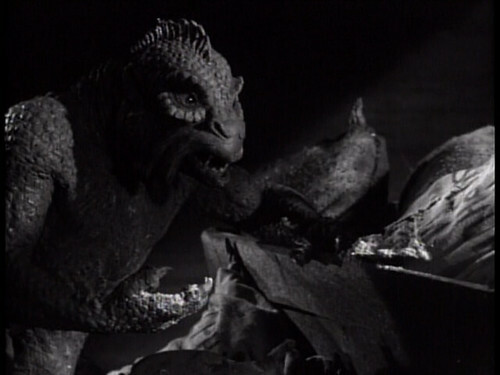 I don’t know that I’ve seen another movie monster quite like him, not even in Harryhausen’s other films. What also makes the film so memorable was the attention paid to the look of the whole film. 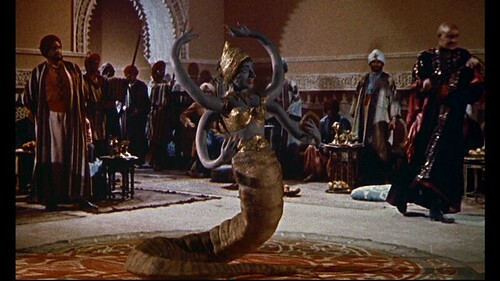 It’s a mythical Arabian Nights setting with more magical effects sprinkled throughout than any other Arabian Nights film since THE THIEF OF BAGDAD (1940). 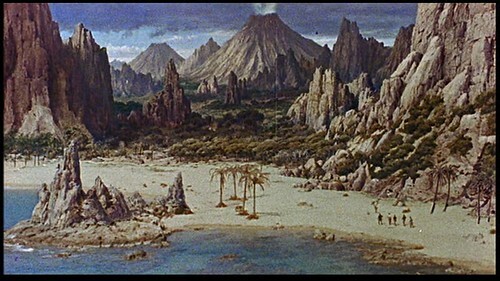 Also, the island where Sinbad’s seventh voyage takes him is filled with imposing terrain supplied by actual locations in Spain, augmented by masterful matte paintings. You’re truly entering another world in this film and exploring all sorts of hidden corners of it. 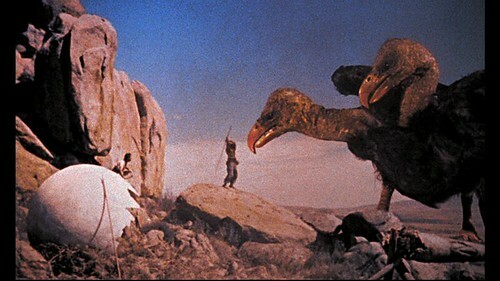 Yet SINBAD wasn’t the first example of Harryhausen’s work I’d seen. 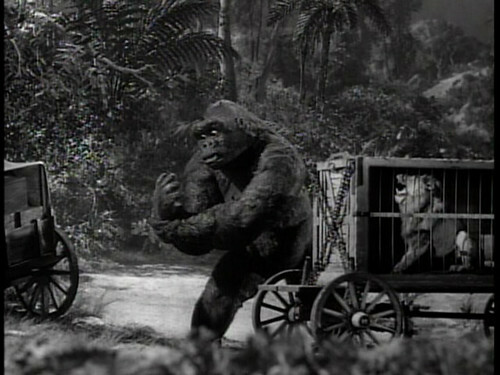 I’d already seen MIGHTY JOE YOUNG (1949) on TV, on which Harryhausen did much of the animation of the giant ape of the title, working as an assistant to his mentor, stop-motion pioneer Willis O’Brien, who did the effects for KING KONG (1933). I quickly caught up with MYSTERIOUS ISLAND, FIRST MEN IN THE MOON and VALLEY OF GWANGI when they came to TV. 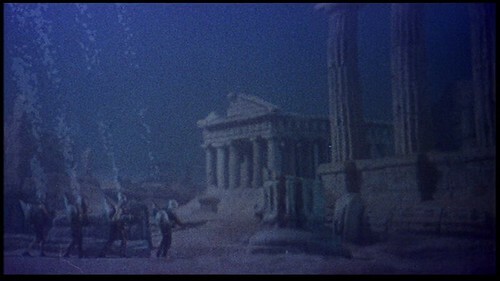 I also caught Harryhausen’s earlier black-and-white films on TV during this period: IT CAME FROM BENEATH THE SEA, EARTH VS. THE FLYING SAUCERS, and TWENTY MILLION MILES TO EARTH. 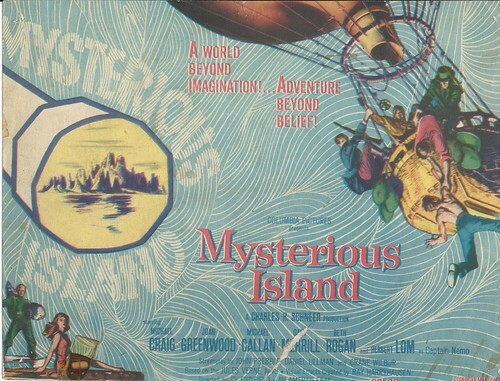 I had the extra treat of seeing MYSTERIOUS ISLAND in a 16mm film showing in the school auditorium at Junior High School 45. This was the film that first turned me on to Bernard Herrmann, the eminent film composer, who also scored SINBAD, GULLVER and JASON. I had noticed the music in JASON when I first saw it and remembered the bombastic theme music long afterwards, but hadn’t yet registered the composer’s identity. Only when I saw MYSTERIOUS ISLAND in the school auditorium did I catch his name and remember him. He became my favorite composer from that point on. 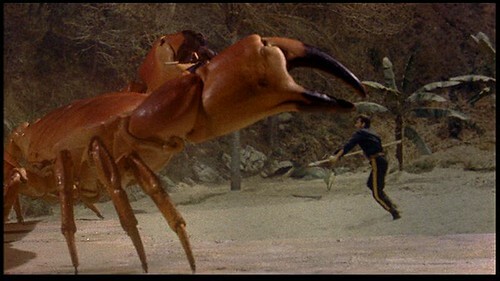 I eventually determined that MYSTERIOUS ISLAND, which I’ve seen over a dozen times, including at a revival theater in Manhattan in the 1990s, is my favorite Harryhausen movie. 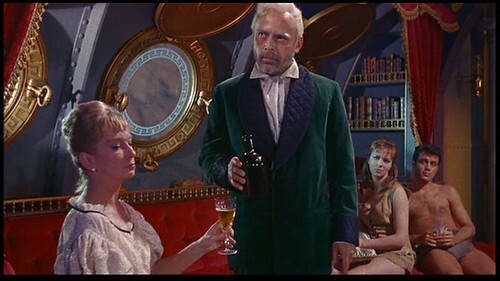 It has a strong storyline, thanks to Jules Verne, a solid cast of actors (possibly the best cast of all of Harryhausen’s films), and location shooting (in Spain) that captures the experience of life among castaways on a remote, uninhabited island, as well as one of Herrmann’s richest scores. It has only four animated creatures in it (all giant versions of existing animals) and the narrative doesn’t actually depend on them for its thrills. In fact, the original novel, which I was inspired to read after the junior high screening, didn’t have them at all. 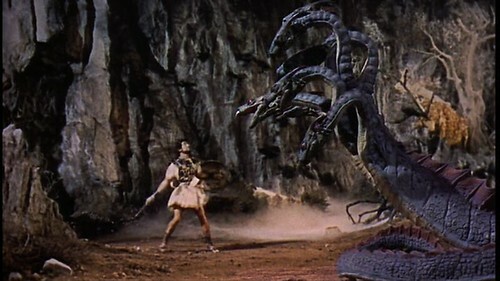 Yet, Harryhausen’s visual flair informs the whole movie. As I understand it, he was involved in the design of every shot that involved a special effect, including the whole balloon sequence, where five men, escaping from a Confederate prison during the Civil War, are transported aloft by a storm for thousands of miles until they drop down in the South Pacific, and all of the landscape shots on the island, with volcanoes seen in the distance, as well as the scenes involving the exteriors of Captain Nemo’s submarine, the Nautilus, and the underwater scenes featuring the ruins of an ancient city. 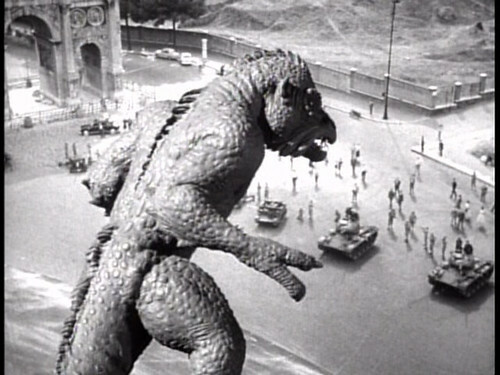 Other movies of his had fewer animated creations—THE THREE WORLDS OF GULLIVER and FIRST MEN IN THE MOON–but were heavily dependent on special effects throughout and somehow didn’t have scripts that were as exciting as that of MYSTERIOUS ISLAND. 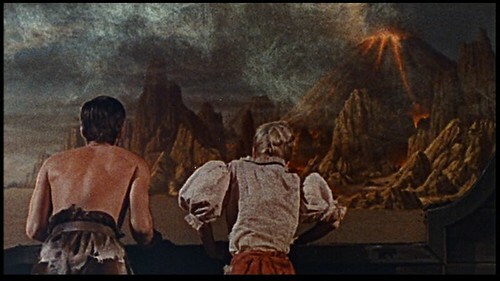 Also, MYSTERIOUS ISLAND was one of the few Harryhausen films directed by someone with his own strong reputation as a director, Cy Endfield, who’d made some hard-hitting crime dramas in Hollywood as well as one of the better Lex Barker Tarzan movies, TARZAN’S SAVAGE FURY, before leaving for England in the early 1950s to avoid the blacklist. 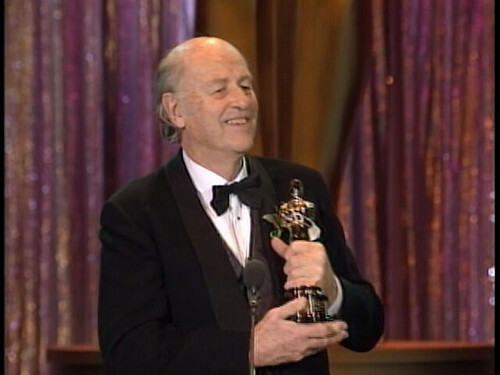 He went on to direct ZULU (1964), a British colonial epic filmed in Africa, and SANDS OF THE KALAHARI (1965), an excellent desert survival adventure without any special effects. 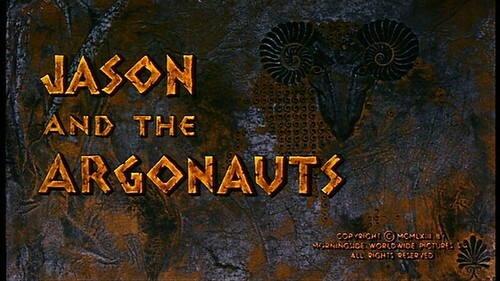 JASON AND THE ARGONAUTS is easily my second favorite Harryhausen movie and a film that is dependent on its effects, but how could it not be with its immersion in the world of Greek mythology and the interplay between Gods and men and monsters. 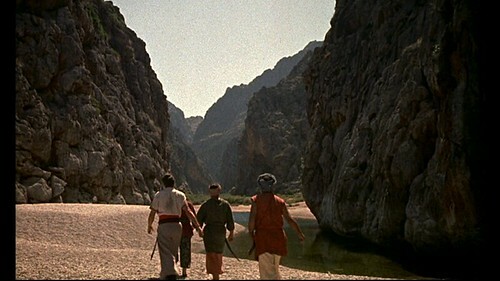 The effects come at you from start to finish as we follow Jason and his Greek heroes on their voyage across the then-known world to distant Colchis to fetch the Golden Fleece. 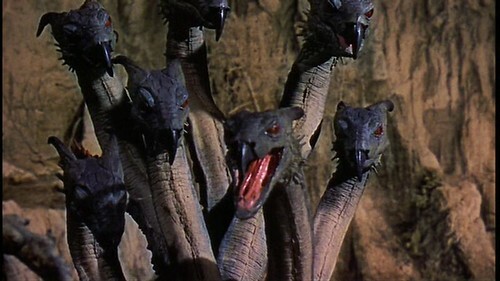 There is a lot of animation in this film, probably more than in any other Harryhausen film and all contained in four setpieces, two of them involving multiple creatures and one involving one with multiple heads. 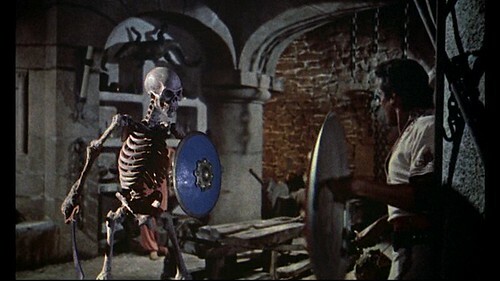 The skeleton sequence alone, featuring seven mobile skeleton combatants, took four-and-a-half months for Harryhausen to animate. 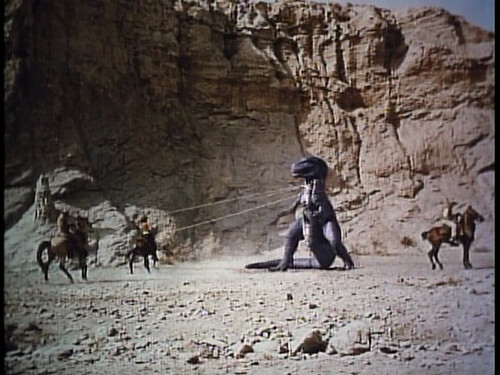 Plus there are many other sequences involving complex effects. When I first saw JASON, 50 years ago this September, I remember being disappointed by the ending because it stopped halfway through the story. I wanted to see what happened on his voyage back to Thessaly and the consequences when he got back. (I’d read several versions of the myth in books taken from the library.) Seeing it much later, of course, I understood how difficult it would have been to cram all the rest of it into a film that was already 104 minutes long! 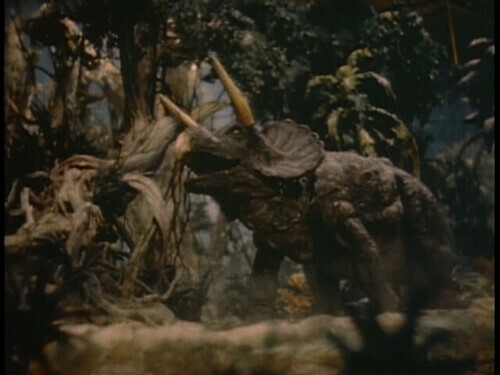 THE BEAST FROM 20,000 FATHOMS (1953) stood out when I saw it as a child because the dinosaur in it was so much more believable than the dinosaurs in so many of the films of its type I saw as a child, which either used lizards dressed up as dinosaurs (ONE MILLION B.C., THE LOST WORLD), cheap models (UNKNOWN ISLAND, THE LAND UNKNOWN) or more crudely animated stop-motion (THE LOST CONTINENT, THE BEAST OF HOLLOW MOUNTAIN). 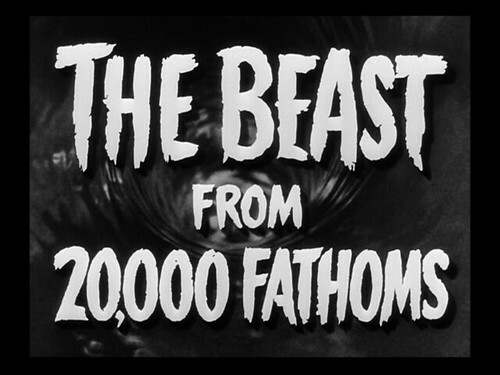 Only KING KONG (1933) had better dinosaurs than the one in BEAST FROM 20,000 FATHOMS. 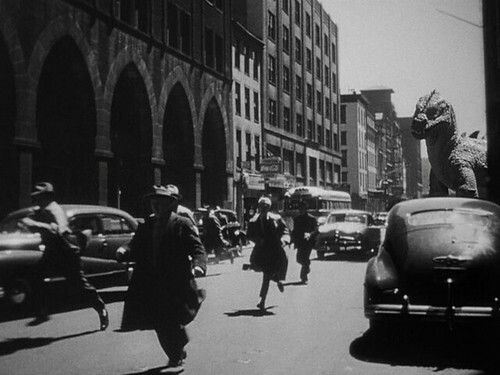 FATHOMS stands out today for its remarkable use of lower Manhattan locations and local extras (who seem to have been recruited from the streets where it was filmed) in the climactic rampage of the Beast in New York. 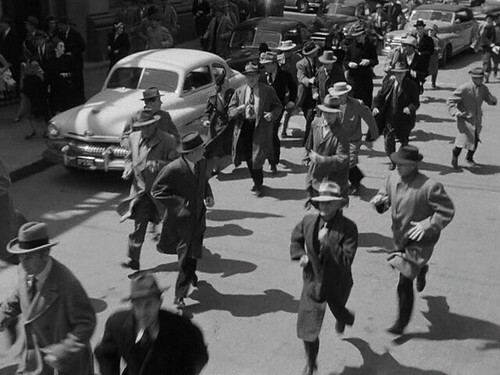 The way the crowds run through the streets established a model that was used in GODZILLA and subsequent Japanese monster movies where Tokyo crowds panic as a monster approaches. 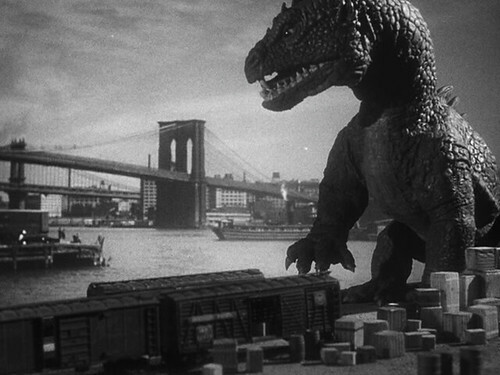 GOJIRA (1954), the Japanese original that was re-edited in 1956 to make GODZILLA, KING OF THE MONSTERS, was in fact a direct result of two Hollywood films: KING KONG, which had been reissued worldwide in 1952, and THE BEAST FROM 20,000 FATHOMS. 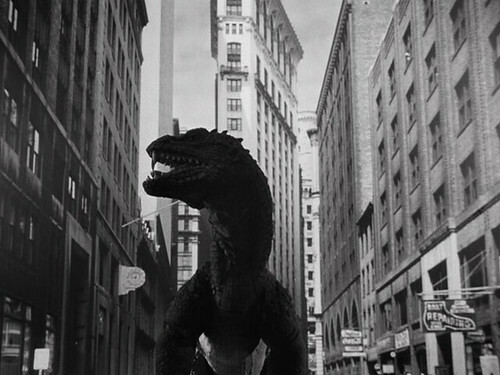 The word, “Gojira,” is a combination of Gorilla and the Japanese word for whale, “kujira.” The makers of GOJIRA toyed with the idea of stop-motion animation, but decided to pursue the cheaper alternative of an actor in a rubber dinosaur suit. (When I saw the American GODZILLA remake in 1998, I felt it was much closer to THE BEAST FROM 20,000 FATHOMS than to any Japanese monster movie.) 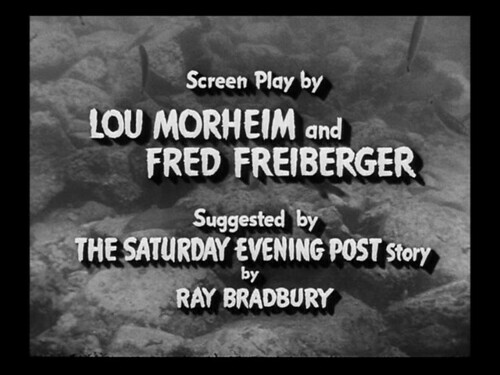 FATHOMS was also the only time Harryhausen worked on a film with his lifelong friend, Ray Bradbury, whose original story provided the idea for the film. 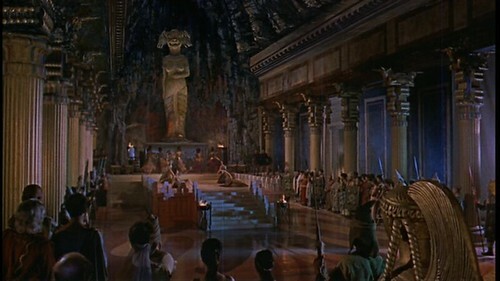 I eventually took my daughter to a showing of JASON AND THE ARGONAUTS at New York’s Film Forum (at its old Watts Street location) and my nephews to a double bill of THE SEVENTH VOYAGE OF SINBAD and THE THREE WORLDS OF GULLIVER at the Film Forum at its current Houston Street location. 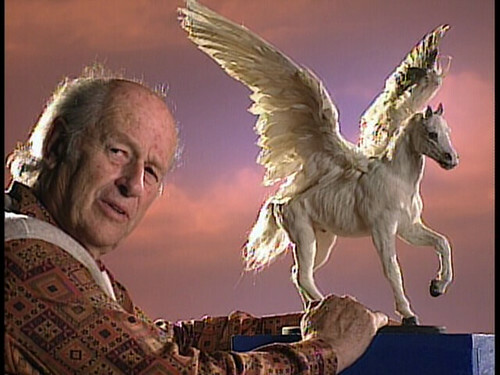 The first of my regrets about Harryhausen’s career is that he made relatively few movies during the last decade of the 30-odd years he was active and absolutely nothing in the 30-odd years since then. Granted, he got a little too old to do all the stop-motion animation himself and he did, in fact, have two assistants on CLASH OF THE TITANS. But is there any reason he couldn’t have supervised a younger team of effects artists on a new production? Was no company willing to fund such an “old-fashioned” production method? 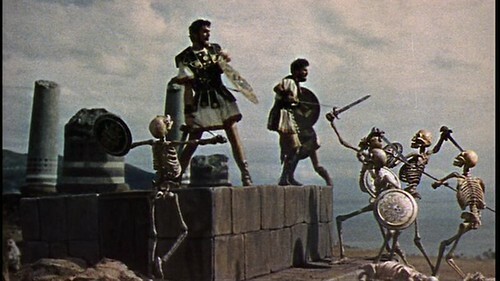 Well, there have been new stop-motion films, from Henry Selick and Nick Park, among others, but none was what you’d call a Harryhausen-style film. 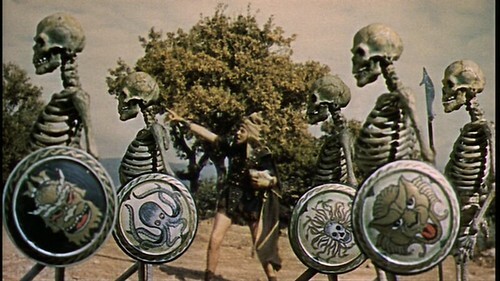 Maybe Harryhausen had just gotten too tired. I can’t believe he’d run out of ideas, but maybe the drive to put them on the screen had diminished. My other regret is more of a lament, actually. 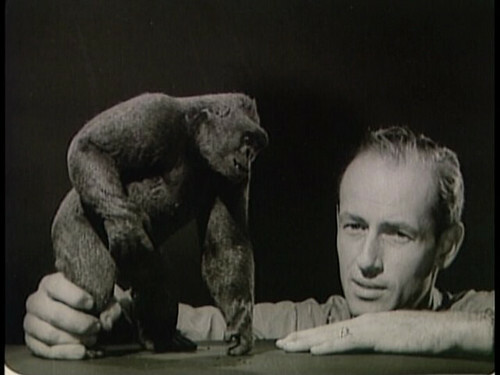 As much of a genius as Harryhausen was, he never made anything that approaches the emotional complexity of the work Willis O’Brien did on the original KING KONG. 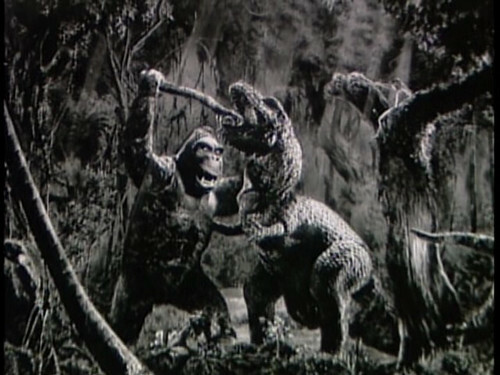 Kong was a giant ape driven by animal drives who was a fierce protector of his own domain against his dinosaur neighbors and someone utterly captivated by the shrieking blond creature who’d been offered up to him by the pesky little natives. 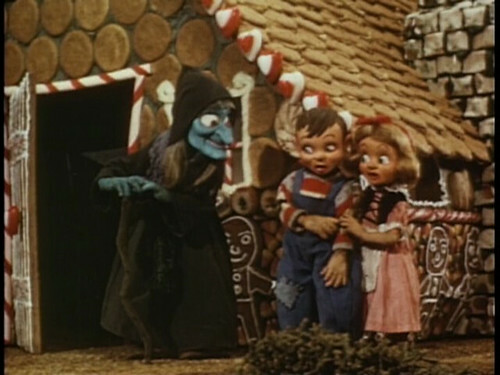 His obsession with her fuels much of the action in the film. While the human cast includes a handful of sympathetic figures, it’s Kong who grips us from start to finish even as he embarks on some truly horrendous carnage. He impresses us as a genuine character. 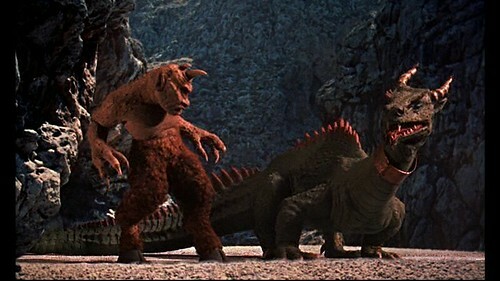 The closest Harryhausen came in creating a similar character was the Ymir, a reptilian refugee from Venus in 20 MILLION MILES TO EARTH (1957), but, as the Ymir grows to giant size, Harryhausen opted to make the creature more of a monster than an alien personality trying to understand the strange world it’s suddenly been born into. Was it intelligent? Could it have made an attempt to communicate with the medical student (Joan Taylor) who nurtures it in its early phases of growth or she with him? 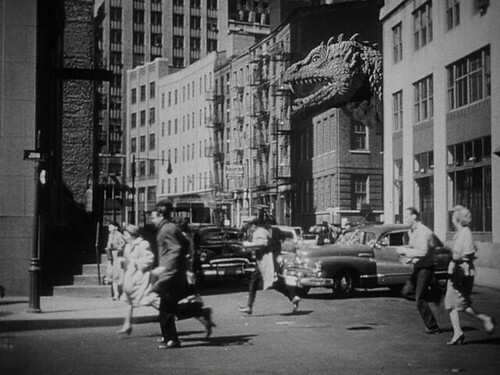 There may have been some hints at this direction before the film quickly became yet another giant monster film. 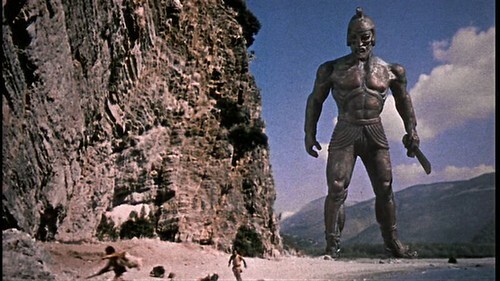 A very good one, to be sure, with location filming in Rome and a spectacular climax at the Colosseum, but one that never allowed itself to experiment with a more ambitious characterization of the Ymir. 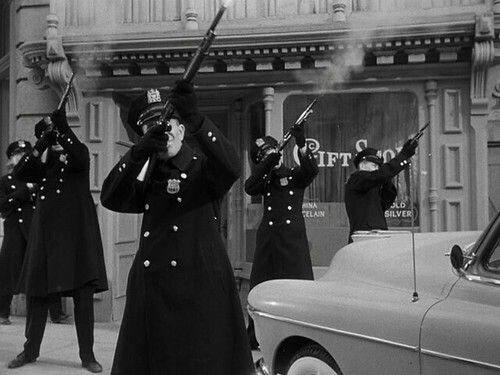 Not that audiences in 1957 seemed to mind. 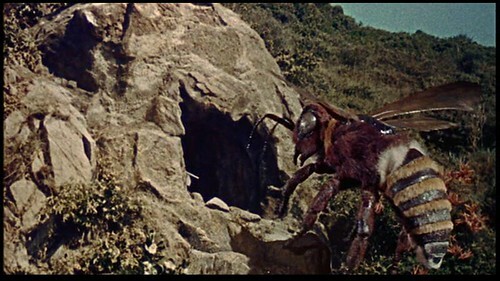 I’m just singling it out as the only film of the ones Harryhausen devoted to a single animated creature that would have lent itself to a Kong-like characterization. 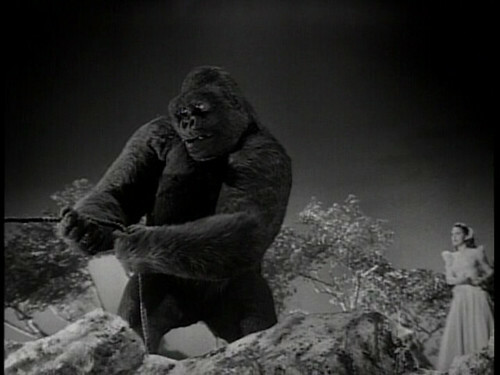 In any event, I would argue that Harryhausen’s finest work, in terms of crafting a believable and compelling onscreen character via animation, would be Mighty Joe Young, which was, of course, supervised by Willis O’Brien. 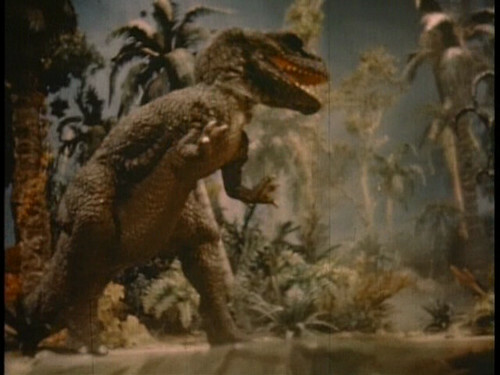 The one film in Harryhausen’s filmography that I’ve never seen is the documentary, THE ANIMAL WORLD (1956), produced by Irwin Allen, which includes a dinosaur segment animated by Willis O’Brien and Harryhausen. 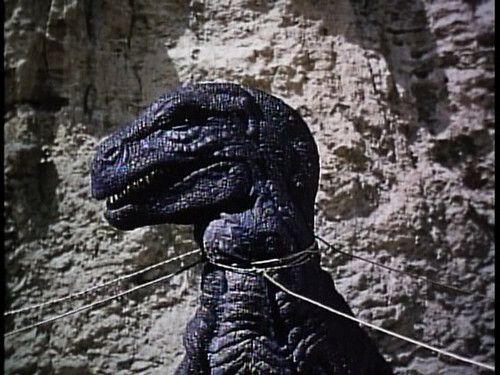 I’d long thought that the film was lost but in researching this piece I’ve learned that the Warner Archive has resurrected it and made it available on DVD and that the dinosaur segment is featured as an extra on the DVD release of THE BLACK SCORPION (1957), for which O’Brien did the effects. I did watch “The Harryhausen Chronicles” for this piece. It’s a one-hour TV special, written and directed by Richard Schickel and narrated by Leonard Nimoy, that aired on American Movie Classics in 1998. 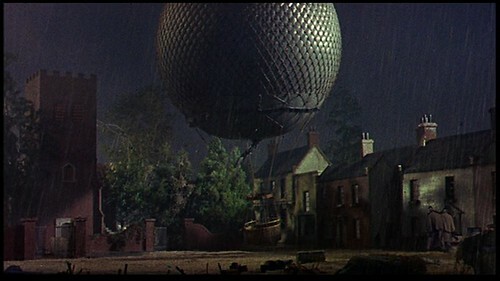 It’s included as an extra on the MYSTERIOUS ISLAND DVD. 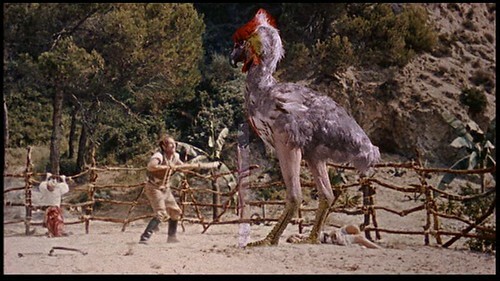 It shows clips from most of Harryhausen’s films, but not THE ANIMAL WORLD. Among the interviewees are Ray Bradbury, who died less than a year ago, and his longtime producer Charles Schneer, who died four years ago. One of the great things about this documentary is the abundance of footage we see from Harryhausen’s early color animated shorts, including “Evolution,” an early work featuring dinosaur animation, and some of the fairy tale shorts he made in the 1940s. Harryhausen and his mentor, Willis O’Brien belonged to an era when special effects were guided by artists and not technicians. They had the touch of the human hand in them and an air of unmistakable craftsmanship and artistry. You can see O’Brien’s blood, sweat, and tears in every animated frame of KING KONG. (I include Godzilla creator Eiji Tsuburaya with his rubber-suited monsters in this group as well.) Today, when teams of hundreds of computer wizards sit at work stations and turn out hour after hour of CGI footage, it’s hard to isolate the sign of a lone visionary. I’m not saying innovative work isn’t being done in CGI—I happened to love Peter Jackson’s version of KING KONG and thought it captured the spirit of the original quite well and reflected Jackson’s artistic sensibility—but it’s getting harder and harder to sift through all the current wave of special effects extravaganzas to find it. 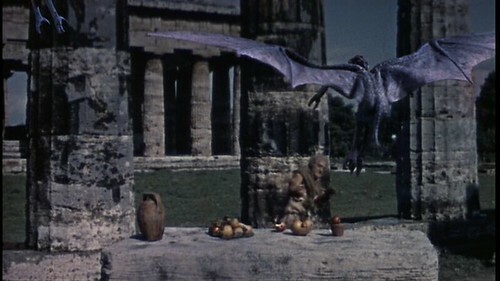 Brian, this is the best of the , thankfully, many Harryhausen tributes I have seen. Many thanks! 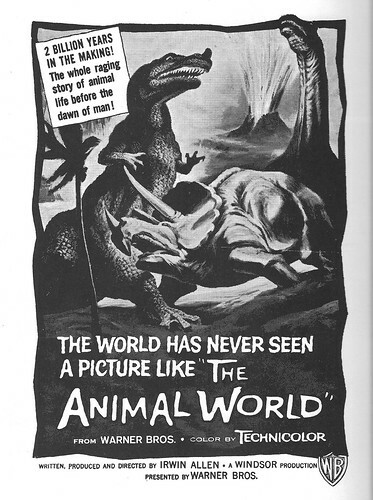 You mention THE ANIMAL WORLD (1956). I think you may have seen it. I remember seeing a documentary with animals and dinosaurs. I think it would have been my first time going to the theater on Tremont between Park and Washington that was later a bowling alley (Crotona?). Claire was a baby and was crying and Mom had to take her out to the lobby. I guess she left me in charge of you and Jane. I was all of 4, 5 tops. You were 2 or 3. I remember the dinosaurs. Hmmm…I don’t remember ever seeing this film, although if it happened that young, I probably wouldn’t remember it. However, I always thought the story of Mommy taking a crying Claire out to the lobby was during CINDERELLA. But, according to my research, CINDERELLA’s re-release would have been some time after Claire was an infant, so you could be right. And, yes, it was the Crotona. the paper. I still have the article somewhere. Brian’s piece on Ray is a perfect example of the Camp-ian recipe: Well-researched film knowledge grounded in that impeccable cinematic background, combined with personal reminiscences, a nostalgic yearning for a past that is always better than today and a swipe at contemporary auds and their new-fangled devices. Of course, it is all very well-written, with great images. Classic Camp by the champ! Keep up the great work and movie memories!